It is the duty of one of the children to go each day to the boulangerie for freshly baked bread. When the bread is brought back to the house, usually sometime between 8:00 – 9:00 a.m., it is set out on the table and eaten with butter and coffee and milk for breakfast. Breakfast is not a social event, but rather, a small meal taken before school or work. However, for the woman of the house, the rest of the morning is spent buying, preparing, and cooking the meal that will be served at 1:00 or 2:00 in the afternoon. Lunch is the main meal of the day, and is usually a combination of fish, vegetables and rice served in traditional and highly elaborate recipes. 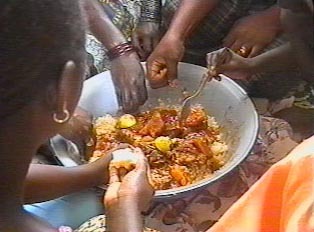 Since lunch is such a special meal, it is usually only cooked by either the mother of the house or a trusted elder daughter. If there are servants in the household, they only prepare the ingredients but do not actually cook. Meat is regarded as a luxury and is generally eaten during the weekend. During the week the protein served at lunch is either fish (including shellfish) or chicken. Lunch generally takes approximately two hours, usually from 1:00-3:00 p.m. It is a meal eaten at home, in a very leisurely and sociable fashion. It is the time of day when family members convene and have extended conversations. A great Senegalese tradition is the drinking of Arabic tea directly after lunch. The tea is brewed in an elaborate process whereby it is passed through tea leaves three times. After lunch, it is not uncommon for family members to take a brief nap. Workers generally return to work at 4:00-4:30 and return home at 8:00 p.m.
Dinner is a smaller meal that takes place between 9:00-10:00 p.m., and can be anything from rice with a light topping or soup and bread, chunks of meat cooked in potato and carrots, or egg dishes. The Senegalese are known for being tall and thin. In part, the thinness is due to the wisdom of eating food that deeply nourishes the body at the times of day when it can best be digested. With the exception of breakfast, the beverage most commonly served during meals is water.